This is the seventeenth in this series of 26 posts, one for each letter of the alphabet, that I am writing during the Blogging from A to Z Challenge, April 2016. You can find all the posts, as they are published throughout the month, by following the A-to-Z April 2016 tag. For better or worse, everything we do has certain qualities to it. There are physical sensations, emotions, and gut-level feelings. We can learn to notice these, and they can provide us with valuable feedback about a situation. We can also learn to deliberately express them, and that can change our experience of the situation. Playing with qualities on the mat. Just tonight in class Sensei led us through a progression of levels, each one defined by the embodied qualities we expressed at that level. That’s a hard idea to grasp if you’re not used to working this way, so let’s look at what we actually did on the mat. We started out by practicing a simple, familiar technique very precisely, exactly as we were shown, step by step. This was our first level. We did this for a little while, switching roles back and forth as we worked with our partners. Then Sensei clapped for us to line up, and asked us how it felt. He was not looking for conceptual interpretations of what we had felt; he wanted the gut-level sensations. Throughout the class we worked through several more levels, each keeping the good qualities of the first, like connection and alignment, but now also allowing for more and more freedom and creativity. By the end of the class the qualities we were expressing in our techniques were quite different. This kind of exercise can be done in almost any context. By paying attention to the qualities we are embodying, we can change the nature of our communication and connection, affecting both our partner’s experience and our own. You can try this anywhere. 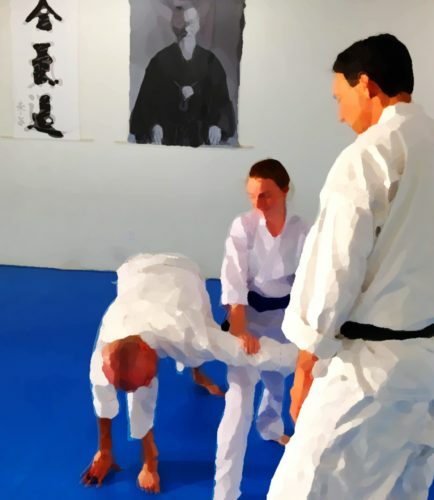 Try it on a walk around the block: “How would it feel if I had more looseness?” Or during an Aikido class: “If I had more firmness, how would that feel?” I used to drive with a strong grip on the steering wheel, sometimes to the point my hands would hurt. More tension that necessary. So I tried asking “How would it feel if I could have more lightness?” It helped. There will be times in life that firmness is called for, and times softness is a better choice. When we develop fluency in a broad range of qualities – not just the ones most naturally comfortable for us – we can have the most appropriate ones available when we need them. Whether you ever set foot in a dojo or not, I encourage you to read “The Intuitive Body: Discovering the Wisdom of Conscious Embodiment and Aikido,” by Wendy Palmer Sensei. Her teachings about qualities (and incidentally, also about meditation) were a great help to me early in my Aikido training, and are something I continue to work with regularly.